With the deadline for firstwriter.com's Twelfth International Poetry Competition fast approaching (October 1, 2013), firstwriter.com has announced a last-minute delay to allow for final entries to be submitted. The competition will now remain open until the first of November! If you haven't yet entered your poems for your chance to win £500 (that's over $750) you can enter online now in seconds by going to https://www.firstwriter.com/competitions/poetry_competition.shtml. As well as the £500 first prize there are prizes of $150 for the best US runner-up, and £100 for the best runner-up from the United Kingdom. All winners and ten special commendations will also receive firstwriter.com vouchers worth $36 / £24, which can be used to take out an annual subscription to firstwriter.com for free, giving full access to our database of over 850 literary agencies, over 1,700 magazines, over 1,500 publishers, and over 100 constantly-changing competitions (you can start enjoying all these benefits now by clicking here). Last month, firstwriter.com announced the launch of its Writers' Handbook 2014 in print and on Kindle. The book was an immediate hit around the world, with sales in the United States, Europe, and the United Kingdom, where it immediately became the number 1 bestselling writing and publishing directory on amazon.co.uk! Rachel North recently acquired a publisher using firstwriter.com's database of publishers. We asked her about her writing, and how she found success. fw: Congratulations on securing a publisher for your book, Rachel! What's your book about, and what's it called? RN: The Book is called A Horse Called Ambition. The title was the easy bit! 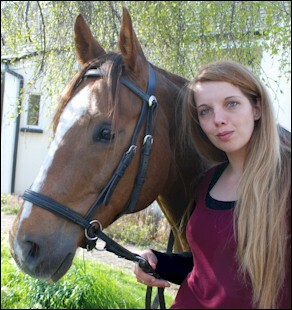 The book focuses on the lives of three women and their horses, one of which is named Ambition. fw: Were you particularly trying to target people with a love of horses? RN: The book is undeniably aimed at animal lovers, particularly horses and dogs, but the story itself mainly focuses on emotions – those that we have for the animals we welcome into our lives, and also the feelings we have for each other, for our backgrounds and for ourselves. A Horse Called Ambition is a journey, and I really hope those that read the book enjoy coming along for the ride. fw: What inspired you to write about horses? RN: I am a bona-fide hands down horse nut! I have been since I was 9 and my whole life has revolved around my horses. I lived on a housing estate growing up and my parents divorced when I was very young, so I definitely wasn't born into a horsey life. I fell in love with horses the first time I rode and from then on I dreamed of rural living and a horse of my own. I never stop appreciating the immense trust they place in us to allow us to ride them and work with them and I never take just being able to spend time with them for granted. Many of the great and traditional Equestrian novels focus on the height of competitive and professional riding, larger than life characters and elite priceless horses. I wanted to tell a story that ordinary horse lovers with ordinary problems could relate to. It isn't all about riding – for the thousands of UK horse lovers it is often more about getting covered in mud and working incredibly hard, constantly worrying about the health and well-being of your horse and ignoring the electric bill because he needs a new rug. Then occasionally, you are blessed with a rare sunny day when you are not at work (desperately trying to afford the rug and the electric bill), when you might actually get to ride your horse! And why do we do it? Love. When I wrote a Horse Called Ambition, I wanted to celebrate that love. Our horses are often not just commodities, they become our best friends. RN: The book took about two years to write. Then I spent another year editing, proofing and fine tuning before starting to look at trying to get published. I have a full time job plus two horses to look after and a partner, so writing had to fit in where there was time which made the process slower. I really enjoyed writing it. It was frustrating at times, but once I had solidified my characters to the point where I knew what they would say or do in any given circumstance, it all started to flow. I think character building is so important and if you can bring your characters to life and develop unwavering faith in them, the writing almost happens naturally! I always carry a notepad, or if I had an idea at work on my lunchbreak I would email it home to myself. Sometimes I would even record my thoughts verbally on my mobile phone whilst driving (hands free of course!). If you have an idea or you find yourself thinking about your story, always record it. Your moments of greatest brilliance don't often come when you are sat at your computer in your allotted writing time, they come when you are queuing at the supermarket or trying to concentrate on something else entirely! fw: When did you first find you had an interest in writing? RN: I wrote my first “book” when I was 7, it is in the back of a school exercise book which I should have been using for maths and I still have it! I have done some freelance magazine writing and website and newsletter editing, but this is my first novel and my first experience of having my writing praised. I can honestly say, until the moment I received the email from Indigo Dreams Publishing (“IDP”), offering me a contract, I am not sure I ever really believed it would happen! I have a career, a mortgage and two huge four legged mouths to feed, writing has always been for enjoyment for me rather than something I relied on to make a living. If the book does well and makes me some extra money though, it will certainly be welcome for those electric bills! fw: Do you think it's important to build a portfolio of writing credits before approaching a publisher? RN: In my case, it wasn't very important at all. I would always recommend getting as published as possible by any means to build a portfolio, but IDP judged my book by its own merit and it was the story that was important to them. Another factor in IDP's decision to publish A Horse Called Ambition was my enthusiasm. I was full of ideas for marketing and determined that if the book was published I would work my socks off to try and make it a success. If you believe in your book and you have determination and drive, it never hurts to show it. fw: What were the first steps you took towards trying to get your book published? RN: I tried without success to find an agent, and I really struggled to find publishers accepting début author unsolicited submissions. Within a few months of joining firstwriter.com and finally having access to up-to-date information on the types of publishers who might actually be interested in my book and in new writers, I had a contract. fw: Wow, that was quick! What methods had you tried prior to that? RN: Internet searches and looking at publishers who had published similar material. Many equestrian publishers only publish reference material and although they were accepting submissions, they were not accepting fiction. I did despair for a little while because I was so sure my book had a market, but I had no idea who out there would help me reach it, until I found firstwriter.com! fw:	Were there any particular features of firstwriter.com that helped you? RN: The search facility, and also the facility to bookmark publishers and add your own comments to them: it really helps in creating a short-list for yourself of who you are going to approach. Being able to specifically search for publishers who do not charge the author, your specific genre and type of book, and publishers accepting submissions almost makes the short-list for you! fw:	How did you go about approaching publishers? RN: I sent lots of initial emails to equine reference publishers to test the water and even had interest from a magazine publisher who has now indicated they will help to market the book. It wasn't until I joined firstwriter.com that I started submitting seriously – it wasn't until then that I found publishers who made it easy to submit, because they were actually looking for what I had to offer. After I had signed my contract with IDP, I heard back from another publisher I had found on firstwriter.com and sent the book to, and they also offered me a deal. I felt bad turning it down but chuffed that a second publisher had thought the book worthy! It worked out for the best, though. I am very happy with IDP. They are an independent house and they really believe in what they do. I feel very looked after and like we are all working towards the same thing. fw:	Did you try to secure a literary agent at any point? RN: I approached countless agents with no luck. It was quite depressing at the time, but when I started to approach the right publishers, things started to happen almost immediately. fw:	When you were receiving those rejections from agents, did you ever feel like giving up? RN: Many of the agents I approached didn't even respond, or simply replied and said they were not looking for new clients. They were always polite but a no is always hard to hear, however well it is put! It can be hard not to give up, but I usually gave myself a few months between trying each new avenue to allow the enthusiasm and overall belief in the book to build back up. fw:	What do you think made IDP go for your book? RN: IDP love books, they love stories and they get genuinely excited by new talent. fw:	What was it like having other people get involved with your book? RN: When I had my first set of revisions and questions to review from the copy editor, I was mortified and very defensive! But I soon realised it was going to be a two way process and that actually, any improvement made to the prose was only going to increase the book's chances of success! I became very fond of my copy editor, and I completely respect her. She in turn found love for the book and recommends it wherever she goes! Something I thought was going to be really hard turned out to be fantastic and as much as I thought the book was a finished product when I submitted it, I see now just how much better it is for expert involvement. fw:	What tips would you give to other aspiring authors? RN: Believe in your book. I know it is a cliché but if you genuinely feel your book will sell and could be enjoyed by more than just your friend and your mum, convey that belief! If you have ideas for promotion and marketing, mention them. Writing a novel is a gruelling process which, while rewarding, can consume you and make you rather bad company! If you have researched your market and you have not been afraid to pick apart your own work to get it just right – steel yourself for the next stage. The real hard work doesn't actually start until you are sat with your finished novel feeling all proud, because then you have to start figuring out what you are going to do with it! Put your heart and soul into every submission, don't just saturate the market with the same covering email or letter. Research each publisher and once you are sure they are the right publisher to receive your work, write your submission based on why you feel they are the right publisher and draw on the features of your work which you think will entice them. Then wait – if you send out multiple submissions without waiting a reasonable time for a reply, you could find yourself with too much interest, and it is polite to only submit to one house or agent at a time. fw:	When will your book be available to buy? RN: A Horse Called Ambition will be out at the end of November this year. I am so excited for the next phase! We already have a website where you can register your interest and receive a notification and link once the book is available to buy – www.ahorsecalledambition.co.uk and I am intending to join a stand at the Christmas Equine Fair which is a yearly event held in Devon. The book has a facebook page too which will be regularly updated with the progress of the publishing and printing stages, and will have links to buy once the book is in print: www.facebook.com/ahorsecalledambition. If Ambition sells well and is well received, I will be turning my attention to getting the sequel, Seeing Red, finished and ready to submit to IDP... Getting published has changed my life, I have so much more confidence in all areas, not just writing. I cant recommend this feeling enough! fw: Thank you for taking the time to talk to us, Rachel, and best of luck with all your future writing endeavours! To search over 1,500 book publishers, click here. Chronos Books, from the John Hunt Publishing stable, is seeking authors of historical nonfiction and historical biography. We are looking for nonfiction authors that can cover real history for real people; who can bring to life historical people, places and events in an imaginative, easy-to-digest and accessible way. We want writers of historical books, from ancient times to the Second World War, that will add to our understanding of people and events rather than being a dry textbook; history that passes on its stories to new readers. Sarah-Beth Watkins, Commissioning Editor, says: "We are really excited about this new imprint and are actively seeking authors to work with us to produce great history books. At the moment, we are looking for books on major historical eras and biographies of the great and famous. We are also looking for proposals for books that shed new light on old information and authors who have found new sources, using top notch research to explore historical people, places and events. We will look at any ideas you send us in and if we like what we read, we will ask you to send in a full proposal so our team can assess your work for publication." If you have a passion for history, can bring to life historical figures or have an historical revelation to share with the world, then Chronos would like to hear from you. At the moment, Chronos is taking submissions through its partner imprint, O-books. Log on to www.o-books.com and submit your initial idea through the Authors Inquiries section including "For Chronos Books" in the subject heading. If we like what we hear, we will ask you to submit a proposal. Proposal are sent through our electronic system and we would ask you to include as much information as possible; word count, chapter list, the first three chapters, marketing opportunities and your books unique selling points. We are looking for books of around 45,000 words plus. Chronos Books is a part of John Hunt Publishing, which also publishes fiction, religion, mind, body and spirit, paranormal, astrology, culture, society and politics, amongst other things. For more information about Chronos Books click here, or visit the website here. Laura Thomas Communications are running two Junior Authors Conferences for writers aged 9–21 over the next year: one in Canada in October and the other in London in May. Canadian author Laura Michelle Thomas will host a one-day writers conference for ages 9–21. Thomas, who has been holding a free Junior Authors Short Story Contest for young writers for six years, went international in 2013, attracting more than 1,800 young writers from 67 countries. The winners of the 6th Annual Junior Authors Short Story Contest will be announced live from the conference, which is taking place at the Sandman Signature Resort in Richmond, British Columbia on October 19, 2013. Tickets are available online, and scholarship applications to cover the cost of the conference ticket are being accepted until September 30. The conference, which Thomas has specifically designed to fit the needs of teens and young adults (ages 9–21), includes six workshops by industry professionals such as young adult author Darlene Foster, author and storyteller Lois Peterson, along with journalist Deneka Michaud and George Opacic, author and past-president of the Federation of British Columbia Writers. Thomas will be acting as host for the day as well as facilitating a Q&A session for parents on how to support their young writer. Several members of Thomas’ corporate team of young freelance writers will also be on hand to provide administrative support and assist the participants as needed. Key sponsors for this event are Thomas’ company, Laura Thomas Communications, the Delta School District, and Albany Books in Tsawwassen. Looking forward to 2014, Thomas has already booked a venue for a Spring Junior Authors Conference in the United Kingdom. The one-day event will take place on Sunday, May 18, 2014, at the Manor House Hotel in Guildford, Surrey. To register or apply for a scholarship to the Fall Junior Authors Conference in Richmond, British Columbia on October 19, please visit http://www.juniorauthorsconference.com.